Los Cañones is an advanced dive that we do occasionally, as the conditions can be extreme but this site can be a real highlight for the advanced diver. The currents are strong at times so we often do this as a drift dive, sometimes by anchor, sometimes as a free descent. Often the plan is finalized at the site. From 25 meters we descend to a canyon at 30 meters. The drop off from there is to 70 meters. Either we descend down the wall to 40 meters, or travel the ridge at 30 meters, looking down into the abyss! Everything here is big and impressive. 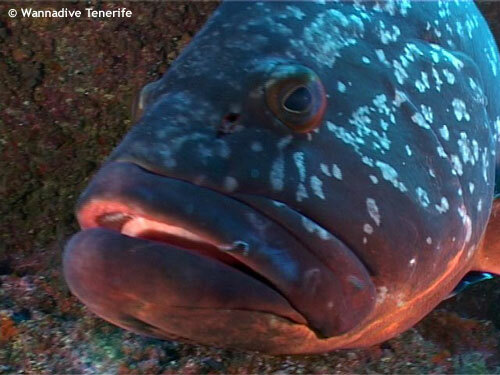 You will see giant impressive volcanic canyons, enormous barracudas and the only place in Tenerife where we have seen big Grouper!! The current is normally too strong to return to the anchor so the boat will follow us. SMB's are mandatory.